You are viewing comment page 187 of the post. View the post contents here. Hi! It’s normal that with the last version of the driver (v1.81 for Win 10) and a Asus Xonar DGX there’s no more a GX button in the Xonar DGX Audio Center? Yeah, I can confirm it’s missing. It has to do with these new 1825 audio drivers. There might be ways to enable GX but I think C-Media probably disable it for a reason. If you really really want to turn GX on, I will try to help you enable it. Np man. It’s just curiosity! i don’t really need it and i can wait for a new release! Thanks for your time and your help! XonarSwitch works fine with STX II on v1.81a drivers. Thanks for the feedback. Can you tell me which Windows 10 build are you running? is there a command to add it ? By any chance did you install the drivers with “Low DPC latency” configuration? To add Asus Audio Center to startup, look at this guide and add to startup folder the Asus Audio Center shortcut. no,just the normal asus option. If I set the low latancy option ,will it also install the asus control panel? I really wanted it to start in the taskbar by the clock. Do you have the Asus Audio Center in Start->All Programs->UNi Xonar Audio or C:\Program Files\UNi Xonar Audio\Customapp\AsusAudioCenter.exe? Because if you have that, you can add it to startup following the guide linked in my previous comment. With Low DPC Latency configuration you have access to Asus Audio Center but it does not autostart with Windows. Hi. Maybe it’s blocked by your security software. Try disabling it and see if it works. If you are familiar with Windows Event Log, you could check those System and Software logs if they mention anything about what happens. If you aren’t successful, you could install first the 1.80a drivers and install the 1825 audio driver only from v1.81. You can find the v1.81a driver only and method here. After you’ve installed 1.81 driver only,when uninstalling you will need to follow the 1.81 uninstall procedure that’s described in the release notes. Glad to hear you’ve found a solution. Have you changed the UAC settings or you had the Windows defaults? 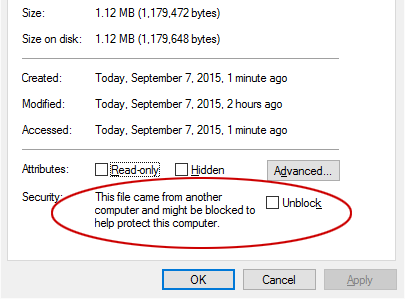 Can you upload or send me a screenshot with the unblock setting from file proprieties? Thanks. Have you used Internet Explorer or Edge browser to download the driver file? I installed v1.81a rev.2 (low DPC version) and it works fine on a Xonar D1, Windows 10 64-bit. Watched some youtube videos, played some games with Dolby Headphone (using Xonar Switch for configuration,) everything works. did Asio are updated too to the .14 for the stx? In 1825 v1.81a drivers ASIO is 2.0.0.12. The 2.0.0.14 is only avaiable with STX II 11.5 v1.80b drivers. they told me that new drivers coming soon or later..
is there anyway to incorporate them with the 1.81 drivers ? Currently no. When I have more time I will take another look at this. to integrate latest asio on the stx’s drivers would be great! Hi, i have just bought ASUS Xonar DG and i’m running it on windows 10 64bit. I have installed your latest drivers (original drivers don’t work) and i’m unable to switch the sound card to use 6 channel output. I have 5.1 speakers and only stereo 2.0 signal is coming thru. Can you please give me some advice how to turn on other channels? If i’m trying to play test sound, only left front and right font is playing. Hi. Are you using analog or S/PDIF output? In case you used analog output, have you set the Audio Channel to 6 and Analog Out to 5.1 in the audio panel you are using? Have you tested the speakers within Windows Speaker Setup? Was your card properly detected by the UNi Xonar installer? Hi Carved, where’d you get these drivers from? Are these an official release from C-Media? I checked on their website for the C-Media 8788 chipset (Essence ST in my case) but couldn’t find anything related to it. They states that for W10 you have to check on the vendors official website for drivers of your card. Thanks anyway, they’re working great. Hi. I’ve got them from HTOmega Claro drivers which has them from C-Media. Thanks for the new driver package! So far working well under latest Win10 x64 (v1825). Hi, I could really use some help. Maybe I have a DOA card? Might be DOA. Check that your card EEPROM isn’t overwritten. Try your card in another PC. I just bought an Asus Xonar DGX. I had the official drivers installed and I was able to test my speakers and hear a positive test. I uninstalled those, downloaded the latest UNI and installed those, now my center and sub test gives me no sounds in the Windows test. Through C-Media control panel I can’t test any speakers and get sound of it. I’m running the latest version of windows 10 pro x64. The speakers are connected through analog or S/PDIF connection? Make sure the connectors are properly plugged. Try uninstalling and installing the v1.81a drivers again. If that does not work try with v1.80a drivers and v1.75a. Let me know of the results. On the latest UNi Xonar W10 1825 v1.81a r2, running the built in driver cleaner wiped my equalizer settings/profiles, so it took me a while to fine tune everything again. Please address this in your next iteration of your Uni Xonar Driver. Thanks. Thanks for the comment. I took the liberty to edit your comment so it does not sound harsh. This might be a valid suggestion/complaint especially since I’ve replaced the standard driver uninstaller with UNi Xonar Driver cleaner in v1.81 which forces the cleaning of equalizer profiles with no option to bypass. You’ve created the eq profiles with C-Media Panel or with ASUS Audio Center? My intention for driver cleaner wasn’t to delete the equalizer profiles but some other settings that where stored in that configuration file. I am not sure atm, but I think the standard uninstall process would have deleted them as well. I will see if I can come up with a solution to save the equalizer settings from deletion. If not, I will update the FAQ with an entry on how to save the profiles yourself. Am i stupid AF? Or why can´t i find a “download”-button! On the page press Ctrl+F and type download. If I install drivers only is the sampling rate set to the Windows speaker properties advanced Default Format? Or is it still set by some software like C-Media Panel and ASUS Audio Center? So if I were to purely install the drivers through Device Manager, can I change the sampling rate for the soundcard? You can use XonarSwitch to change the sampling rate. If you install the drivers only, your sample rate will be set to 96Khz and it can be control only by C-Media Panel, Asus Audio Center, XonarSwitch or editing the registry. I don’t know why would you want to install only the audio drivers. There are multiple settings that are applied only when installing the full driver package. I started getting huge fps drops in Overwatch after installing UNi Xonar W10 1825 v1.81a r2. I am going to remove them and reinstall the drivers from ASUS website (Xonar DX). Possibly a premature complaint and not related to drivers, but I’ll post back after a few hours of testing without them. If it’s working alright with the Asus drivers, you should again try with v1.81a. If you still notice performance problems with v1.81a, you should try with previous UNi Xonar driver versions. Let us know of any developments. I reinstalled the 1.81a r2 again seems to be working great! Not sure what could have caused the problem originally. Been playing Overwatch all day without any fps drops. Maybe it was a scheduled antivirus scan, disk defragmentation or Windows downloading updates.